An extremely attractive and monumentally proportioned 1857 map of Constantine, Algeria by the French cartographer A. H. Dufour. Shows roads, rivers, caravan routes, cities, and topographical features. A large inset in the lower right quadrant details European holdings in North Africa. Prepared by Charles Dyonnet as plate no. 44 (alternately numbered 21 and 28) in A. H. Dufour's 1857 issued of the impressive elephant folio Atlas Universel. 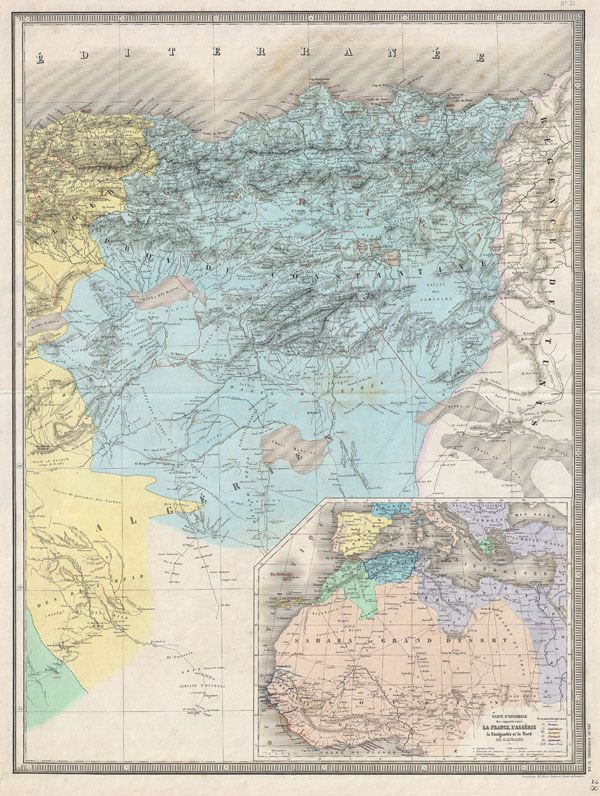 Dufour, A. H., Grand atlas Universel physique, historique et politique geographie ancienne et moderne. (1857 issue). Very good condition. A couple of minor marginal repairs on verso. Light overall toning.